The following is a partial list of quotes from Glenn Beck. It was acquired with permission from the website, News Corpse: The Internet's Chronicle of Media Decay. Reading these, bear in mind that the understanding here is that Glenn Beck is not crazy; he just sounds that way. It is all an act, but a very compelling one. 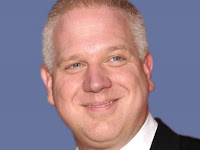 Glenn Beck Unhinged is a compendium of crazy/hate speech from America’s #1 fear mongering tele-pundit/pastor. This growing Bottom Feeder’s Digest of dyspathetic dimwittery begs the question: What the [hell] does this jerkwad have to say to get fired? Dangerous sociopath, entertaining clown or just a jerkwad? Update: For more entertainment of this sort, see "The 50 Worst Things Beck Has Said On Fox News."